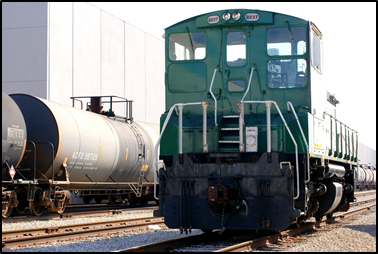 Locomotives supply customer product to our high capacity packaging lines. 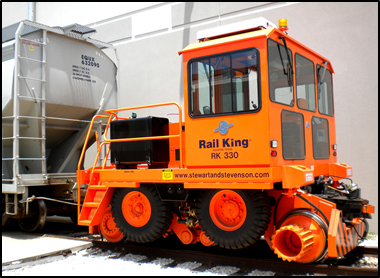 These engines keep rail yards moving, with high rolling stock turnover. Locomotives provide flexibility in the placement of railcars within Frontier’s tracks. These 1550 cubic feet (44 cubic meters) agents, installed in standard 40 foot ISO containers, are used to eliminate pockets and reduce friction during loading and unloading. They are designed specifically for bulk plastics and other dry bulk goods. Some benefits include: Low cost intermediate product storage, no liner, disposal or installation fees, no risk of liner failure, and ease of trans-loading into bulk trailers. 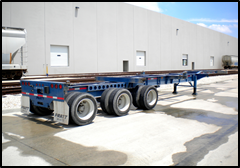 Our container chassis allows us to bypass chassis yards and go directly to and from the port or rail ramp. The chassis reduces unnecessary fuel use and increases productivity of trucks. Frontier keeps variable costs low by avoiding long lines for equipment, wasting fuel and under-utilizing trucks. Road-rail vehicles are used to bring cars to the packaging lines. They are capable of lifting off the rails and repositioning themselves on rubber tires. These trucks safely tilt containers to facilitate unloading into a packaging operation, bulk truck or railcar. 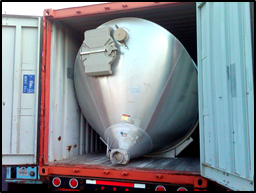 They are used for eliminators and bulk lined containers. Frontier is equipped with Bartlett trucks. An instrument used to take containers off chassis and stack them for long-term storage. The heavy container lift allows for flexible chassis use and reduces long-term storage cost.